Flyers fans shouldn't be bitter, they should be in awe of what's happening in Vegas. 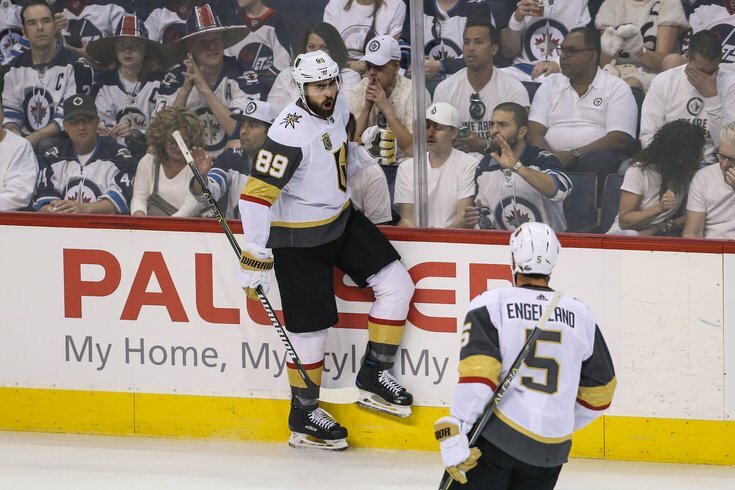 Here are some words of advice for some of the people trying to figure out how the Vegas Golden Knights have earned a spot in the Stanley Cup finals – shut up and enjoy it. There is no logical explanation for how a first-year expansion team managed to literally defy the odds and earn a spot on the National Hockey League’s biggest stage. There is no logical explanation how the NHL decided to be the first league to place a platform in Las Vegas, and see this story quickly blossom in the desert. It might be a tough pill to swallow in places such as Buffalo, St. Louis and even Philadelphia where the quest for a Cup has gone on for what seems like forever. It sure does hurt the moral of so many fans who have waited so long for a championship to see a team with no history get to the finals. True enough, but it’s hardly a reason to halt what should be the excitement of watching a truly amazing sports story reach its final chapters. The Vegas Golden Knights are the most remarkable story in North American professional sports. Then again, when your home base is Las Vegas “good luck,” might have a very special meaning. In this case, it’s been a lot more good selections and a team that simply did not limit its expectations. There was every reason to be satisfied with a good start, or a good half season, and then even a good regular season. And then came the playoffs. The Knights rolled over the Los Angeles Kings and swept goalie Jonathan Quick, toasted the San Jose Sharks in six games, and then completed a “Gentleman’s sweep” over the Winnipeg Jets, losing the first game and then winning the next four. The so-called nice story of the Vegas Knights is no longer just a nice story. Instead it’s a BIG story. It’s the Mighty Ducks turned into the mightiest team in the National Hockey League, and the final chapter looms in front of us as the Golden Knights will play either the Tampa Bay Lightning or Washington Capitals when the Stanley Cup finals open next Monday night in either Tampa or Las Vegas. Think about that – the expansion Golden Knights are sitting in the desert and waiting for the powerful Tampa Bay Lightning or the Capitals with Alex Ovechkin play a game seven to see who will earn the right to face them. This is the stuff of fiction turned into reality. For those who might have forgotten, the Vegas launch was haunted at its start by the tragedy of the mass shooting at a country music concert in that city. It was a community that needed some healing, and the populace found some comfort in its first pro sports franchise. If that sounds corny, consider that several years ago the Boston Bruins made a huge playoff push and comeback after the Boston Marathon bombing. In a sports world that has been taken over by analytics, stories like this are a reminder of the inner mechanism that makes athletes tick. Of course, there are the actual hockey aspects to all of this, and the constant with any hockey team – expansion or otherwise, is the importance of a goaltender. Enter Marc-Andre Fleury, the goalie the Knights got from Pittsburgh in an expansion draft scenario. Barring a total meltdown, Fleury has probably already clinched the MVP status in these playoffs. He has been a huge part of the Golden Knight’s success, both on and off the ice. In addition to his goaltending, Fleury has embraced the importance of selling the game in the new town. Fleury is well on his way to being the Vegas what Bernie Parent was and is to the Philadelphia market – and this is after earning star status with a winner in Pittsburgh. General Manager George McPhee did a wonderful job of combining talent with character which is best exemplified by selecting William Karlsson from Columbus, and James Neal from Nashville. There was also the selection of Pierre Edouard Bellemare from the Flyers. Bellemare was such a “character” guy with the Flyers he was awarded an “A” as an assistant captain. That is quite a testament to a fourth-line penalty-killer who earned that much trust in the locker room. McPhee wanted that type of player, and he added it into a roster bolstered by the mistakes of the Florida Panthers who surrendered Jonathan Marchessault and Reilly Smith. Adding further to the Florida timeline, Vegas coach Gerard Gallant was previously fired by the Panthers. You can break it down any way you want, but the best idea would be to forget that your team hasn’t been to the big stage in such a long time and simply enjoy the best magic show in Las Vegas and the world of pro sports, the Golden Knights.